Dallas Stars agitator Adam Burish apologized to a gamer for blowing a play in NHL 11 but maintained that it wasn't really his fault at all. I was recently playing a game of EA Sports NHL 11. I was down by one goal against my friend, I was on a 2 on 0 and was impeded by #16 Adam Burish, and was unable to achieve a scoring opportunity, I ask that Adam Burish publicly apologizes to me for he had cost me that game of NHL 11. Thank you for you cooperation during this crisis. It's the sort of thing that annoyed gamers toss out into the ether all the time, venting their frustration with whatever passing irritant has most recently ruffled their feathers. Alex was probably pretty surprised, then, when Burish not only responded to the email, but actually gave him the apology he demanded. 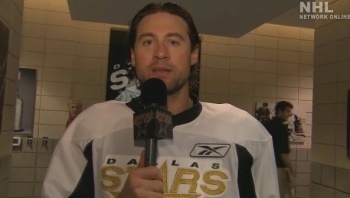 "Sorry I ruined your game," he said in a video posted to the Dallas Stars website. "You know what, though, when your guys are that slow, they get in my way, so whoever's controlling them, I don't know if it's you or the computer, maybe you should have a talk with them." "They're just in my way, their passes are in my skates, it was a mess out there. Get your guys going, get your guys skating a little bit so they get out of my way, alright?" he continued. "Sorry I ruined the game, but talk to your guys next time." Burish, who came to the Stars for the 2010-2011 season after spending four years with the Chicago Blackhawks, told NHL On the Fly that he's actually not a gamer himself. "I'm not much of a video game guy. I haven't played it," he said. "But I think I gotta do it now."